After much anticipation and a nearly two year wait by fans since it was first announced, 1428 films and the crew behind Never Sleep Again: The Elm Street Legacy have delivered unto us Crystal Lake Memories: The Complete History of Friday the 13th, the horror documentary to end all horror documentaries. If you’re reading this then chances are you’re a fan of the Friday the 13th series. I certainly am, as are many of us here at The Bits, and we’ve all been waiting patiently for this set to be released. They’re some of my favorite horror movies, despite being cheaply-made and a little sleazy, in some cases. But they’re both fun and inventive, and genuinely scared me when I was a kid. I’ve talked at lengths about my personal opinions on all of the films in the series elsewhere, so I won’t bore you and go on about them again. After all, you’re here for the scoop on this great documentary, right? For those who might not be aware, director Daniel Farrands and some of his crew from this project had originally produced the His Name is Jason: 30 Years of Friday the 13th documentary for Paramount during the release of the Friday the 13th reboot. Unfortunately, due to creative struggles between the crew and the studio putting it out, that documentary wound being a 90-minute flop, at least in my eyes. It didn’t really cover a whole lot of ground with the people behind the scenes on the making of all of the films in the series and was basically a bunch of celebrities and fanboys talking about their experiences with the films. It was a disappointment to me, as well as to other fans who were salivating at the possibility of learning more about the movies that they loved so much. I was among them. At that time, there weren’t any boxed sets or Deluxe Edition DVDs of these films (some of which Daniel Farrands had a personal hand in producing extra content for btw), so there really wasn’t a lot of information about the making of the films out there. There were some online websites with bits of information, but nothing really conclusive or all-encompassing. Enter author Peter M. Bracke (an old friend of The Bits from his DVD File days), who several years later published the book Crystal Lake Memories: The Complete History of Friday the 13th. It, more or less, blew the lid off the behind the scenes stories about the film, at least in a more detail-oriented way than had been done previously. Around the same time, Daniel Farrands, Andrew Kasch and a host of others were putting together the mammoth A Nightmare on Elm Street documentary Never Sleep Again: The Elm Street Legacy. The two forces behind both projects eventually came together with the idea of turning the contents of the book into a documentary, and now, after much hard work, this great documentary is here. First things first. This documentary dwarfs Never Sleep Again’s four-hour running time, being almost twice as long: seven hours. That’s absolutely incredible, but understandable. The documentary covers all ten of the original films in the Friday the 13th franchise, plus the reboot, the TV series and Freddy vs. Jason. That’s a hell of a lot of content to try and compress and stick to a narrative, and they’ve done a wonderful job with that. Many will note that they also covered Freddy vs. Jason in Never Sleep Again, which I originally thought might be a detriment to the overall documentary. It turns out that it isn’t. It takes a look at the film in a different light, which is from the Friday the 13th franchise angle. It winds up feeling fresh in that regard, which is always a good thing. They also don’t waste a lot of time talking about how Friday the 13th and Jason himself relate to pop culture. They do a little bit, but not to the point of boredom. More time is devoted to the actual making of the films themselves and the people behind them, which is how I’d prefer it. The pop culture bits were in abundance in the His Name Was Jason documentary, so they didn’t need to get into that again. Thankfully, they didn’t. They also managed to create some original content to go with it as well, including chapter titles based on each of the original film’s title cards. There’s also a great wrap-around segment with Corey Feldman talking about Jason to some camp counselors who meet their grisly demise by the end. The geek moment comes when *spoilers* Feldman dons the mask of Jason and waves a machete at the camera, signifying that Tommy Jarvis is the new Jason, as it might have been. It’s a terrific moment and makes the documentary go out with a huge bang. Following it all up with the some of the actors from the films reciting their lines to camera is just icing on the cake. To say the least, it’s the best seven hours I’ve spent watching TV in a very long time. Making its debut on both Blu-ray and DVD (a direct response to the outcry from fans who were dismayed by it being an HD title only), Crystal Lake Memories looks terrific, but talking about the visual and audio quality of this documentary is kind of pointless, in my opinion. It uses a variety of different source materials, both digital and analog, to tell its story. All of the film clips that have been utilized are taken from HD sources (except for Part VI, which is explained detail in the audio commentary). Other material like various deleted scenes, behind the scenes stills, newscasts, talk show clips, etc, are all sourced from VHS tapes and old photographs that are in various conditions, sometimes not the best. The deleted scenes from Part VII, in particular, are sourced from a VHS copy of the workprint that’s in pretty terrible condition. So not everything is going to appear pristine and detail-oriented. And not that I think it should. It’s a little rough around the edges, but the interview and wrap-around segments all look great. Even some of the interviews that were shot for Never Sleep Again and are repurposed for this documentary look even better than they did before. The audio is much of the same: from a variety of sources but never sounding even all the way through. It’s a 5.1 Dolby Digital track, but when all is said and done, the documentary on the whole looks and sounds fantastic. The interview audio is very audible and well-balanced, even up against what little bit of score there is underneath of it (and during the chapter headings). It’s a fantastic presentation. There are also subtitles in English and Spanish for those who might need them. In the extras department, there’s not too much to be found just looking from the outside in. There’s an audio commentary with Farrands, Bracke and co-editor Luke Rafalowski, which is a very educational and fun listen. If you bought this release from the recent Dark Delacies signing event or the Crystal Lake Memories website, you get a bonus DVD containing a whopping four hours of extended interviews. And none of this stuff is just material that wasn’t good enough for the main documentary. Some of the juiciest bits are actually in this particular section. It’s all sequenced from film to film, like the documentary itself, and there are little surprises here and there to be found. One of the best is a specially-shot segment entitled Legends Never Die: Hollywood Forever. It features Tom McLoughlin, director of Part VI, taking us on a tour of the famous Hollywood Forever Cemetery, where he wrote the film. There’s also a great music video from Ari Lehman’s band First Jason in there, as well. So yes, this is definitely worth picking up for the extra cash to get this disc. Outside of that, the only other extras available are three trailers: one for Never Sleep Again on Blu-ray (which is, confusingly, NOT available as the advertisement says it is), a trailer for the More Brains! A Return to the Living Dead documentary (another great one, btw) and a segment featuring Adrienne King and her Crystal Lake line of wines. Fans expecting a packed bonus disc of various content like the Never Sleep Again release had might be a little disappointed with the extras at first, but I was more than satisfied with the bonus content, and the fact that there’s a seven hour commentary on the documentary itself is just fantastic (and a likely record-setter, if you ask me). What this all boils down to is that Crystal Lake Memories: The Complete History of Friday the 13th is worth every bit of wait by fans. It’s also definitely worth forking your cash over for the extra bonus disc as well. 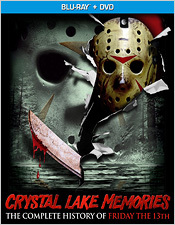 If Never Sleep Again perfected the horror documentary, then Crystal Lake Memories goes beyond the pale and surpasses it. This is THE finest hour for horror fans the world over. Actually it’s seven hours, but never mind. And both thanks and admiration are in order for Peter M. Bracke’s wonderful book for the being the foundation for it all. Both the documentary and the book complement each other beautifully and are well worth your time and money.